Monks and priests across the world often wonder how to make their religious faith relevant to the younger generation. In societies where life is busier than ever, where cities are swelling and families dispersed, the religious rituals of yesterday do not seem so relevant. But in Japan, a group of Buddhist monks are trying to change that. They have secured a regular spot at a jazz bar where they seek to enlighten and entertain. Chippie Sound Music Bar is tiny and full of smoke - not incense, though, but cigarette smoke. This is a bar after all. There is cold beer on tap and a cool crooner on the stereo. This is not normally where you would expect to find a trio of monks. 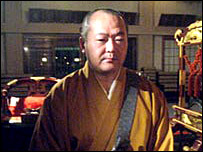 But Hogen Natori and his two friends believe this is as good a place as any to spread the word about Buddhism. As they make their way to the stage they ring a small bell. The small crowd falls silent. Then the chanting begins and strangely haunting melodies fill the space. 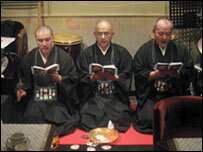 It is Shomyo chanting, a style of Buddhist chant found only in Japan. This is what you might call "Buddhism-lite" though. It is performance, not preaching. After their first session on the stage, which lasts about 20 minutes, they sit down with the audience for a drink and a chat. One of the monks gets a bag of balloons out of his pocket and starts sculpting balloon flowers for some of the older ladies sitting around the room. "Many Japanese don't want to come to temple," Hogen Natori says. He is standing behind the bar where he has lit up a cigarette as he chats with the drinkers. "They think Buddhism is very difficult, and deep and serious, but Buddhism is much more than that - exciting, funny even. I want to spread this kind of teaching." He feels people are more receptive in a bar, when they are drinking and with friends. He gets a warm response from the crowd. Some are a little older than you might normally expect to find in a bar like this, but they are clearly charmed by the younger monks. "It was wonderful," says one woman. "It was my first time but I am really glad I came to listen to it. The chanting itself was superb and so close by. It was wonderful." Another first-timer was similarly impressed. "It's amazing," he said. "The Shomyo sounded great. I feel really relaxed." 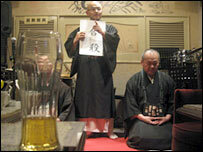 The monks say that their decision to perform in bars like this has upset some Buddhists. One woman told them they should not "lower themselves" in this way. "What do you say to your critics?" I ask Hogen Natori. "Come and join us," he replies. "We are telling people what Buddhism is, what monks are. "When people hear our chants they look relieved," he adds. "How nice!" Then it is time to get back on stage for the second half. Again silence, and then again the haunting chants of a bygone age, the three shaven-headed monks in their grey robes kneeling in front of us, sharing their faith with the drinkers.